Glam it up with your little one! 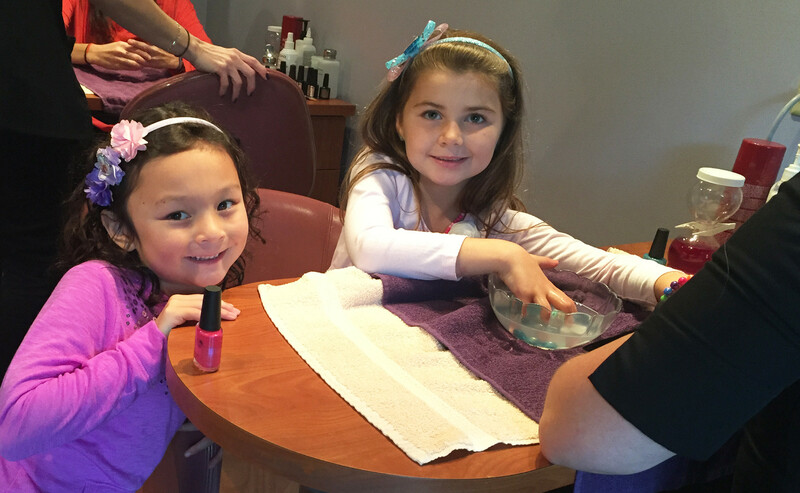 They’ll be treated like royalty as they indulge in fun-flavored manis and pedis. Or, teach your mini-me the valuable lesson of relaxation with a specialty massage. Begin with a soak, followed by a strawberry or chocolate exfoliation, and finish with strawberry or chocolate lotion and choice of nail polish. Leave with a lollipop! For children ages 4 and up. Enjoy a steaming cup of hot chocolate while feet are soaked in a chocolate milk-bath, manicured and exfoliated with a chocolate scrub. Finish with an application of chocolate mousse lotion, choice of nail polish. For children ages 4 and up. Begin with a soak followed by strawberry exfoliation and finish with a strawberry-kiwi lotion. Toes are polished in your favorite shade. For children ages 4 and up. In our high-pressure world, massage is very healthy for children to relieve sports injury and stress. For children ages 10 and up. Back, Neck & Shoulder Massage. For children ages 10 and up. Children under 18 must have an adult in the room at all times. Children must be over 10 for massage and over 4 for manicure or pedicure. We ask you to have your child understand that the spa is a quiet place. Soft voices must be used, and absolutely no cell phones or electronic devices brought into the spa.